Pizza di Joey, LLC takes the utmost pride in serving superior quality, NY-style brick oven pizza to its customers. Founder and CEO, Joey Vanoni, crafts pizza by combining authentic recipes and traditional baking techniques with fresh, seasonal ingredients sourced from farms and markets in the greater Baltimore area. Joey was born and raised in Perth Amboy, New Jersey and learned the culinary art and science of pizza baking on a coal fired, brick oven in one of the country’s first pizzerias founded in 1930. After high school, Joey enlisted in the United States Navy. In his eight years of active military service, Joey has travelled far and wide, serving on land and at sea aboard submarines. In his travels, Joey’s passion for baking pizzas grew into a way for him to help boost morale among his fellow service members; a small taste of home quickly became an eagerly awaited, weekly tradition. Joey has baked pizzas everywhere from hundreds of feet under the sea, to the hills of Afghanistan. 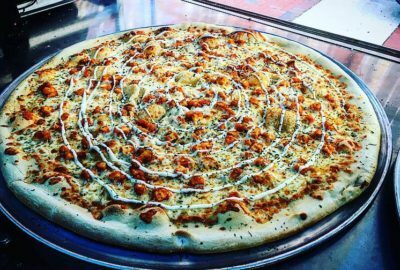 Now, after nearly a decade of service, Joey is bringing his authentic, NY-style pizza to the streets of Baltimore. Joey remains dedicated to serving and helping those who have served and defended our country, freedoms, and the American spirit. Pizza di Joey employs veterans and disabled veterans to ensure that meaningful employment is afforded to those who have sacrificed so much in order to guarantee that Americans can safely indulge in simple pleasures, like pizza. Visit their website at www.pizzadijoey.com.